Can video game composers make you smarter? Well, video gaming can be a pretty cerebral activity, requiring astute problem-solving skills and disciplined concentration in order to excel. That's especially true for any game built around strategic and/or tactical gameplay, such as real-time or turn-based strategy, tactical shooters, multiplayer online battle arenas (MOBAs), and online collectible card strategy games. To succeed in these types of games, players must assess the current situation and formulate a plan that accounts for future developments and variables. Without this type of tactical forward-thinking gameplay, a gamer has little chance to win. So, can music enable gamers to think tactically, stay focused and make smart decisions? Over the next three articles, I'll try to answer that question, while exploring the role of music in enhancing the concentration of strategic/tactical gamers. Along the way, we'll be taking a look at some scholarly research on the subject, consulting the opinions of experts, and I'll be sharing my experiences creating the music for the recently released Dragon Front strategy game from High Voltage software. We'll check out some music tracks I composed for the popular Dragon Front game (pictured at the top of this article), and we'll discuss methods for supporting and enhancing concentration for strategic/tactical game players. But first, let's take a closer look at the Dragon Front game. 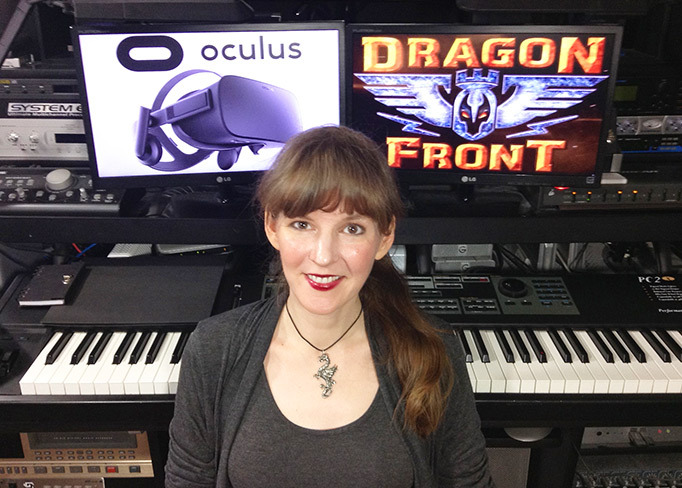 Dragon Front was released on November 16th and is now available from the Oculus store. The game expands the traditional strategy mechanics of famous titles like Hearthstone and Magic: The Gathering into an awesome virtual reality space. Already, the game has gotten a lot of recognition for its focus on strategic gameplay. "Dragon Front is a ton of fun, and it takes a lot of strategy to win," says Tyler Robertson of HardcoreGamer.com. David Jagneaux of UploadVR.com adds, "The core mechanics are similar to CCGs you’ve played or heard of before, but there is a lot of added strategic depth with the game and how its grid-based battle system works." Writing for TheVerge.com, journalist Nick Statt adds, "Dragon Front was an exhilarating experience that mixes the tense moments of high-level strategy play with the full-body escapism of VR." Strategy games have a long and venerable history with such celebrated releases as Civilization, Homeworld, Age of Empires, Starcraft, Total War, Magic: The Gathering, and now VR titles like Dragon Front. These types of games have huge followings of dedicated players who have spent hundreds of play hours developing their strategic skills. Watching these games being played is most reminiscent of an intense chess match. Gameplay proceeds by orderly turns, players consider their options carefully, and the pacing tends to be slow and thoughtful. With this in mind, the musical choices of a video game composer become especially important. In a game that will invariably include substantial pauses allowing players to consider their options, the music has the potential to vividly stand out. However, even under these conditions, we as video game music composers still have to ensure that the music facilitates gameplay and doesn't become a distraction. So, what musical styles and techniques will work best to accomplish that goal? Well, first let's consider this: it's been suggested that the very nature of video game music makes it perfect as an aid to concentration. In an article for The Guardian, journalist Dean Burnett took a look at different genres of music in an effort to select the best background soundtrack for concentration and study. His conclusions were interesting. "Some people argue that one of the best music genres for concentration is the video game soundtrack," he writes. "This makes sense, when you consider the purpose of the video game music: to help create an immersive environment and to facilitate but not distract from a task that requires constant attention and focus." Even more fascinating is his follow-up observation later in the article: "The music in video games has been refined over decades to be pleasant, entertaining, but not distracting. The composers have (probably unintentionally) been manipulating the attention systems in the brains of players for years now." It turns out that science has revealed a concrete connection, and it involves three important characteristics. In this article, we'll explore the concept of 'music-message congruency,' and how that can assist strategy gamers in making smart decisions. This concept has its origin in the field of musicology. The idea is that music intrinsically delivers emotional and cultural messages. By virtue of its instrumentation, construction and genre influences, music has the ability to convey a lot of information to listeners. For instance, let's consider a theoretical piece of music in the modern rock genre, with acoustic instrumentation, in a minor key with a downbeat tempo. This music would naturally convey the sense of a contemporary setting in which some unfortunate event has occurred, bringing about negative emotions. Now, if this music were used as the background for a glossy, futuristic puzzle game with cheerful colors and peppy energy, then the result would be a lack of "music-message congruency." The style of the music simply wouldn't fit the circumstances of gameplay. While unconventional musical choices might produce interesting artistic effects, they might also have unintended negative consequences. According to research studies, when there is an absence of "music-message congruency," the result is a reduction in the ability of the listener to concentrate. For instance, in a study for the Journal of Marketing, a team of researchers led by Dr. James J. Kellaris examined the potency of music use in radio ads. They found that when the music was incongruent with the message, listeners would have trouble absorbing and remembering information contained within the advertisement. Likewise, in a scientific study for Memory & Cognition Journal, a research team found that using incongruent music as the background score of a film would negatively impact the audience's ability to remember details from that film. It seems that if the music and the message are not consistent with each other, the audience experiences a reduced ability to concentrate. This is one of the reasons why it's so important to communicate well with the game development team, so that we as game composers align our music carefully with the information the game is trying to convey. In Dragon Front, the world of the game combines fantasy characters and monsters with the technologies and aesthetics of World War II. In order for the music to be congruent with that message, it had to convey elements of both an epic high-fantasy conflict and a global war during the industrial age. The ideas of industrial mechanization and fantasy warfare were prevalent throughout the Dragon Front video game, and I carried these musical influences throughout the score I composed for the project. This helped to keep the music congruous with the message of the game. So, if 'music-message congruency' helps players to absorb details and remember information during gameplay, that means we're one step on the road to making our strategy gamers smarter! In the next article, we'll be talking about 'cognition-enhancing tempo' and its role in sparking alpha waves that stimulate cognitive activity. In the meantime, please let me know your thoughts in the comments section below!